Not to be confused with Shiite. 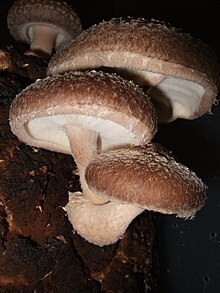 The shiitake (/ʃɪˈtɑːkeɪ, ˌʃiːɪ-, -ki/; Japanese: [ɕiːtake] ( listen) Lentinula edodes) is an edible mushroom native to East Asia, which is cultivated and consumed in many Asian countries. It is considered a medicinal mushroom in some forms of traditional medicine. The mushroom's Japanese name shiitake (椎茸) is composed of shii (椎, shī, Castanopsis), for the tree Castanopsis cuspidata that provides the dead logs on which it is typically cultivated, and take (茸, "mushroom"). The specific epithet edodes is the Latin word for "edible". Rarely, consumption of raw or slightly cooked shiitake mushrooms may cause an allergic reaction called "shiitake dermatitis", including an erythematous, micro-papular, streaky pruriginous rash that occurs all over the body including face and scalp, appearing about 24 hours after consumption, possibly worsening by sun exposure and disappearing after 3 to 21 days. This effect – presumably caused by the polysaccharide, lentinan – is more common in Asia but may be growing in occurrence in Europe as shiitake consumption increases. Thorough cooking may eliminate the allergenicity. ^ Berkeley MJ. (1877). "Enumeration of the fungi collected during the Expedition of H.M.S. 'Challenger', 1874–75. (Third notice)". Botanical Journal of the Linnean Society. 16 (89): 38–54. doi:10.1111/j.1095-8339.1877.tb00170.x. ^ Pegler D. (1975). "The classification of the genus Lentinus Fr. (Basidiomycota)". Kavaka. 3: 11–20. ^ "GSD Species Synonymy: Lentinula edodes (Berk.) Pegler". Species Fungorum. CAB International. Retrieved 2015-03-09. ^ a b Wasser S. (2004). "Shiitake (Lentinula edodes)". In Coates PM; Blackman M; Cragg GM; White JD; Moss J; Levine MA. Encyclopedia of Dietary Supplements. CRC Press. pp. 653–64. ISBN 978-0-8247-5504-1. ^ Tilak, Shantanu (2019). "The Shiitake Mushroom-A History in Magic & Folklore" (PDF). The Mycophile. Vol. 59 no. 1. pp. 1, 4. Archived (PDF) from the original on 5 February 2019. ^ a b Leatham GF. (1982). "Cultivation of shiitake, the Japanese forest mushroom, on logs: A potential industry for the United States" (PDF). Forest Products Journal. 32 (8): 29–35. ^ a b c Vane CH. (2003). "Monitoring decay of black gum wood (Nyssa sylvatica) during growth of the Shiitake mushroom (Lentinula edodes) using diffuse reflectance infrared spectroscopy". Applied Spectroscopy. 57 (5): 514–517. doi:10.1366/000370203321666515. PMID 14658675. ^ a b Vane CH; Drage TC; Snape CE. (2003). "Biodegradation of oak (Quercus alba) wood during growth of the Shiitake mushroom (Lentinula edodes): A molecular approach". Journal of Agricultural and Food Chemistry. 51 (4): 947–956. doi:10.1021/jf020932h. PMID 12568554. ^ Bowerman, Susan (31 March 2008). "If mushrooms see the light". Los Angeles Times. ^ Ko JA; Lee BH; Lee JS; Park HJ. (2008). "Effect of UV-B exposure on the concentration of vitamin D2 in sliced shiitake mushroom (Lentinus edodes) and white button mushroom (Agaricus bisporus)". J Agric Food Chem. 50 (10): 3671–3674. doi:10.1021/jf073398s. PMID 18442245. ^ Nakano H; Namatame K; Nemoto H; Motohashi H; Nishiyama K; Kumada K. (1999). "A multi-institutional prospective study of lentinan in advanced gastric cancer patients with unresectable and recurrent diseases: effect on prolongation of survival and improvement of quality of life. Kanagawa Lentinan Research Group". Hepato-gastroenterology. 46 (28): 2662–8. PMID 10522061. ^ Oba K; Kobayashi M; Matsui T; Kodera Y; Sakamoto J. (2009). "Individual patient based meta-analysis of lentinan for unresectable/recurrent gastric cancer". Anticancer Research. 29 (7): 2739–45. PMID 19596954. ^ Bisen PS; Baghel RK; Sanodiya BS; Thakur GS; Prasad GB. (2010). "Lentinus edodes: a macrofungus with pharmacological activities". Current Medicinal Chemistry. 17 (22): 2419–30. doi:10.2174/092986710791698495. PMID 20491636. ^ "Shiitake mushroom". WebMD. 2015. Retrieved 5 March 2015. ^ a b c Boels D; Landreau A; Bruneau C; Garnier R; Pulce C; Labadie M; de Haro L; Harry P. (2014). "Shiitake dermatitis recorded by French Poison Control Centers – New case series with clinical observations". Clinical Toxicology. 52 (6): 625–8. doi:10.3109/15563650.2014.923905. PMID 24940644. ^ Hérault M; Waton J; Bursztejn AC; Schmutz JL; Barbaud A. (2010). "Shiitake dermatitis now occurs in France". Annales de Dermatologie et de Vénéréologie. 137 (4): 290–3. doi:10.1016/j.annder.2010.02.007. PMID 20417363. Wikimedia Commons has media related to Shiitake.